In my own contribution “Protecting Universal Rights through Intervention. International Law Debates from the 1930s to the 1980s” I examine how the protection of human rights became linked with policies of military intervention and international law during the course of the twentieth century. Experts on international law from around the world played an important role in this development. As early as the 1930s and 1940s, prominent legal scholars such as André N. Mandelstam and Hersch Lauterpacht began to examine the idea of international intervention on behalf of human rights, arguing in favor of the development of a mechanism to protect these rights. In the mid-1960s, these debates were given fresh impetus by the adoption of two UN human rights covenants in 1966 and the first International Conference on Human Rights, held in Tehran as part of the 1968 International Year of Human Rights. These debates were also taken up by important organizations such as the International Law Association (ILA), and also featured prominently in scholarly articles and in-house research projects carried out by organizations such as the Procedural Aspects of International Law Institute. Last but not least, this heightened interest was also expressed in the form of direct petitions and suggestions for reform made to the United Nations. Rather than emerging suddenly after 1989, I argue that the concept of humanitarian intervention was instead the outcome of a longstanding and complex process. Intervening in the Name of Human Rights. From the Left Bank to Libya. Protecting Universal Rights through Intervention. Responsibility to Protect and Tû-Tû Concepts. 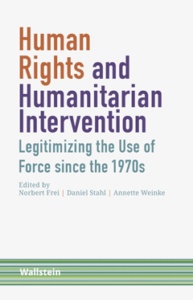 This entry was posted in Actualités / News, Books and tagged 20th Century, Human Rights, Humanitarian Intervention, International Humanitarian Law by Fabian Klose. Bookmark the permalink.